Presenting Inscriptions from the Catacombs by Normand Lockwood and seasonal selections by Palestrina, Rutter, Alfvén, Kauffmann, Vantine & others. Event Information: Doors open at 3:30 PM. Refreshments will be served immediately following the concert. Rehearsals for the Fall 2019 concert begin Thursday, August 26, 2019 at The First Presbyterian Church of St. Louis, 7200 Delmar Blvd ( at Overhill Drive ), University City, MO. The choir meets in the church sanctuary (enter from Overhill Drive). Registration for the term is from 7:00 – 7:30 PM, with rehearsal following until 9:00 PM. Please see the FAQs below for membership details. For the remainder of the term, rehearsals will run each week on Monday evenings from 7:15 – 9:15 PM up to the Christmas concert in early December. Click to reveal the answer What is the Bel Canto Chorus of St. Louis? We are a non-audition, community choir that brings people together to sing beautiful and challenging choral music, and teach individuals how to improve their singing. We welcome new members, regardless of training or experience. Click to reveal the answer Does Bel Canto perform publicly? Yes. We typically perform two concerts a year; early December on the theme of Christmas; and late April/early May on the theme of Easter and renewal. Since 2016, we have performed our Christmas concert at Christ Church Cathedral (Episcopal) in the City of St. Louis. The spring concert is typically held at a mainline church in St. Louis County. Click to reveal the answer Where and when does Bel Canto rehearse? We rehearse in the sanctuary of The First Presbyterian Church of St. Louis, 7200 Delmar Boulevard (at Overhill Drive) in University City. Rehearsals follow a fall and spring semester schedule and are held on Monday evenings from 7:15 - 9:15 PM. The Fall term begins the last Monday of August (with a break for Labor Day), and then continues through until the Christmas concert in early December. The Spring term begins the first Monday in January following the Martin Luther King holiday, and continues through to the concert in late April or early May. Click to reveal the answer Is there a fee to join the choir? Yes. The current fee is $70/semester which pays for the services of our music director, musicians, and costs associated with performances. Members are allowed to keep their music between rehearsals. As a practice aid, we also post vocal parts for most of the songs we sing on our web site. See the navigation menu above. Membership fees can be paid to our treasurer either by check or money order. 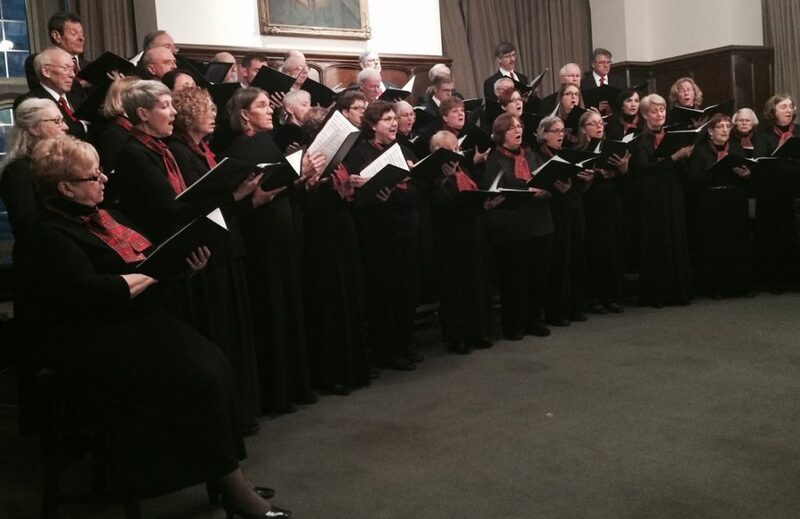 Make funds payable to ’Bel Canto Chorus’. Click to reveal the answer Can I attend a rehearsal before I join the choir? Yes. It’s best to do this within the first few weeks of the term while the choir is getting acquainted with the music. Click to reveal the answer How can I support Bel Canto if I can’t sing in the choir? Attend one of our concerts. Better yet, tell a family member or friend about us, and bring them along too. Make a financial gift to support Bel Canto. We are a registered Federal and Missouri non-profit, charitable organization dedicated to promoting the arts and fine choral singing throughout Saint Louis.